Last week I had the idea of putting together a couple of thoughts on how to achieve financial freedom at any income. I came up with exactly two ideas, but I’m thinking about include a 3rd idea. What do I mean by “reasonable”? I’m saying that you can be financially free even if you don’t make a huge doctor or lawyer salary. You can be the Average Joe… if you can manage your expenses well. That’s the baseline assumption I’m making here. It might be best to think of this as advice for someone starting with a clean slate. I was fortunate to have learned today’s point before I even graduated. At last year’s FinCon, I met Monica Louie and she told me about her story of getting out of debt. It’s an amazing story that I will (cruelly) save for another day. An idea flew into my funnel. (These are phrases you use when you are a parent to a 3 and 4 year old who love Thomas the Tank Engine.) I can’t confirm or deny if this idea may have been aided by a couple of drinks at the gathering. Compound interest is a river. You and try to swim upstream by paying compound interest. Or you can float downstream by earning compound interest. Lazy Man and Money is about making my money work so I don’t have to. Can you guess which one I prefer? Let’s imagine that you have $10,000 in credit card debt. A quick Google search tells that the average credit card has 15% interest rate. It’s a little complicated, but you are roughly throwing away $1500 each year. And that happens every year unless you pay off that $10,000. If you throw an extra $200 at it every month, you are paying $2400, but barely making a dent in the $10,000. It’s like you are swimming upstream. You are putting in a lot of work, but you aren’t getting very far. While it is difficult to keep swimming, if you stop the current will just stronger and take you further away from financial freedom. The speed of the river’s current is simply the interest rate. You might have a low rate like a fixed mortgage… or it might be a large one like this credit card example. Let’s instead pretend that you choose to invest $10,000. It is very difficult, perhaps even impossible to make 15% every year, so I’ll use the standard 8% that is a long-term average return of investing when one invests in stocks. Instead of throwing away money, you are receiving free money. The first year you earn $800 and have $10,800. The next year you earn $864 for a total of $11,664. You are getting more and more free money each year. The current of the river you are on is accelerating and all you have to do is keep floating on towards your financial freedom goal. Struggle to Swim or Float: It’s Your Choice! Compound interest is either going to work for you or against you. It’s up to you to decide which you want. However, there are many, many people out there who are spending their money without thinking about where they want the Compound Interest River to take them. That almost always puts them into a situation of swimming upstream. 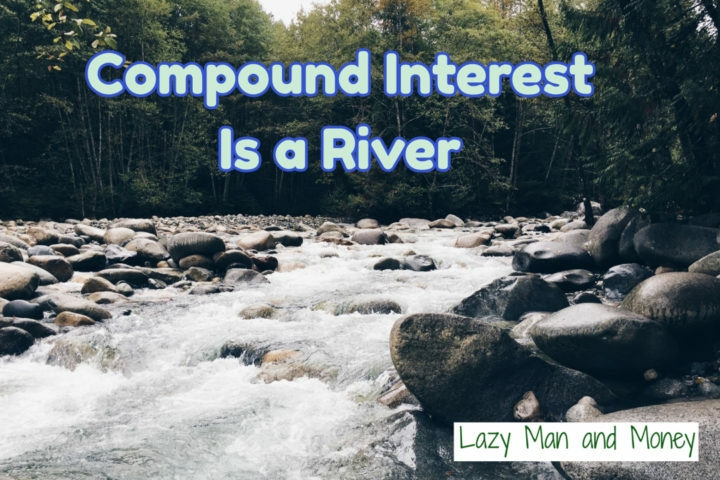 Other people are mindful of how the Compound Interest River works. They are working to increase their floating current by investing and reinvesting more and more money. If your income is smaller, your journey on the Compound Interest River might be longer and slower, but you’ll still likely get to your financial freedom destination. If you are fortunate to have a large income, you may be able to make your river start out a little further towards the goal. Next week, I’ll continue with my next fundamental idea of financial freedom. In the meantime, leave me your thoughts in the comments. A lot of person doesn’t see how compound can make growth their investment. But it’s one of the base of investment.